Boldly Goes Where No Other iPod Has Gone Before!! End the boredom of lap swimming or just enjoy the novelty of hearing music, audio books in the water, on the beach, while walking, jogging, surfing, any activity! Enhancing lifestyles with waterproof electronics has been our business since 1996. This New iPod Shuffle Newest Generation was double treated for 100% waterproofing using two UWATER proprietary technologies: (a) outside-in micro plasma coating (b) inside-out sealing compound. The result - long term in-the-water protection (including salt water) while preserving the integrity of the push button controls and functions. Each unit is fully inspected for functionality and endurance. Unlike other so-called providers who inject glues, our process is such that while unit is double protected, controls are unaffected and are not stiff. And product is backed by one year limited warranty and lifetime customer service. Order NOW and get our new UWATERT3 short Action Earphones & Buds for lap swimming plus our UWATER extension cord - ABSOLUTELY FREE!! Use the UwaterT3 for head mounting while swimming, jogging, any fitness activity. Connect the extension cord to mount your iPod on arm, swimsuit, waist, or shirt pocket. But wait there is more. 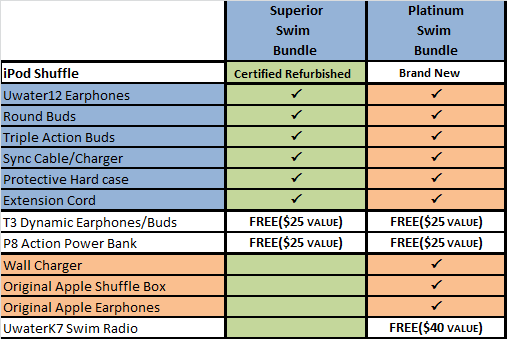 Order this NEW iPod Shuffle now and you will also get our UwaterK7 swim radio Player - ABSOLUTELY FREE! With this K7 latest generation player you can listen to your favorite radio stations - talk, news, sports, traffic, weather while swimming! 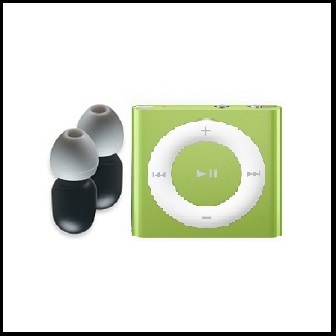 Simply add the iPod to Shopping Cart and the FREE BONUS GIFTS - over $75 in value - will be automatically added to your package with no extra charges. Limited time offer. Act NOW!! Extra Bonus: UwaterP8 Action Power Bank. 100% Waterproof. Tested For Functionality and Endurance underwater. Copper plated 3.5mm Plug-In connection - compatible with all devices. 1 set of triple-action silicon ear-tips. Advanced Digital PLL FM Receiver 88 - 108 Mhz. Large screen (25mm) highly visible LCD (not backlit) . 100% waterproof IPX8 Earphones included! Plug-In Single Port 3.5mm Waterproof Audio/USB connection. 3.5 mm plug in connection - compatible with UwaterK7, UwaterG4, UwaterK8, G5, G5X, Shuffle. 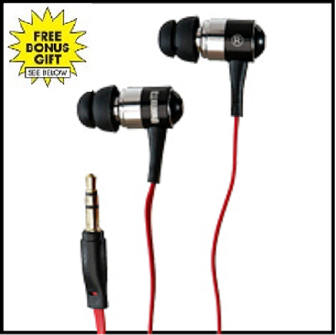 · Compatible with all smartphones & ipods & portable electronics. 21-Day No Question Asked Refund/Return. Beware of cheap imitations. They won't last beyond your first lap. Beware of iPods injected with glue (stiff push buttons). Beware of non-brand providers of waterproof products. Since 1996 our engineers have invested years of R&D on improving Waterproof Audio Technologies (WAT), optimizing in-the-water audio reception, tuning and controls.This media player was waterproofed by Fitness Technologies Inc. (FTI) using proprietary technology developed & perfected over years of experience. Apple's trademarks are used only to describe the product and not to indicate endorsement or affiliation.